7 Days Magic Bakery is an entertaining sim whose sugar daddy is Vivartia, the 35th largest company in Europe. The sim is a bit Willy Wonka and a bit Jetsons. The build is a bit Maya and the jokes are a bit terrible. But bad in a good way if that makes any sense. What really caught my attention though was the production values used in building this sim. There is quality voice acting and what sounds like a custom soundtrack too. It just seemed to put me in a good mood when i arrived. It is essentially a subtle advert. They are not trying to bombard you with their corporate identity. Its not a slap-chop infomercial. It's an advert with the understanding that they have more than a 30 second slot on TV to grab your attention. It is essentially a commercial which has been running since 2008. People come and enjoy the sim and over time the name 7 days is remembered and people like me mention their company on a blog. It's kind of interesting now that I think of it. They have been around for a few years and lets say its cost them around $9500 in tier fees. Then they hired some people to make the sim. I am going to say it cost $20, 000 in voice acting and soundtrack and builders etc. It might be more or less than that I really don't know, mainly because I am an artist and we get paid in crusts of bread and "exposure". Oh that reminds me of a funny video, I will include it at the bottom. But it says online that the average cost for producing a 30 second commercial costs approximately $350, 000. Wow it also says a 30 second bit during the super bowl is 2.5 million. Anyway, its kind of apples and oranges, but considering that I rarely watch TV, and when I do I mute the commercials its pretty expensive. Its even worse if you look at my brother whose TV quite helpfully records shows he likes during the day which he watches at night. But it also cuts out the commercials for him. So is Second Life advertising better than TV advertising? No that's just crazy talk. You need to see a brain doctor, I will drive you there. I can't believe you thought that. But I do think maybe a sim like this is good advertising for the price and more importantly, I think the non aggressive subtle long term approach just makes me like them a bit better. I mean I think we can all agree that they just want our money. Sure my bank says that I am not just a number, but its not like they have ever invited me over for dinner or anything. So I guess if you are going to try to take my money, or imprint your brand on my poor brain, then please do so in the least annoying fashion. I should mention though that you need to make sure your media is set to stream automatically. It will play dialogue once you get within a certain radius. Also go find the factory part, you can make some humorous pastries there. I counted at least two swear words in this video below. 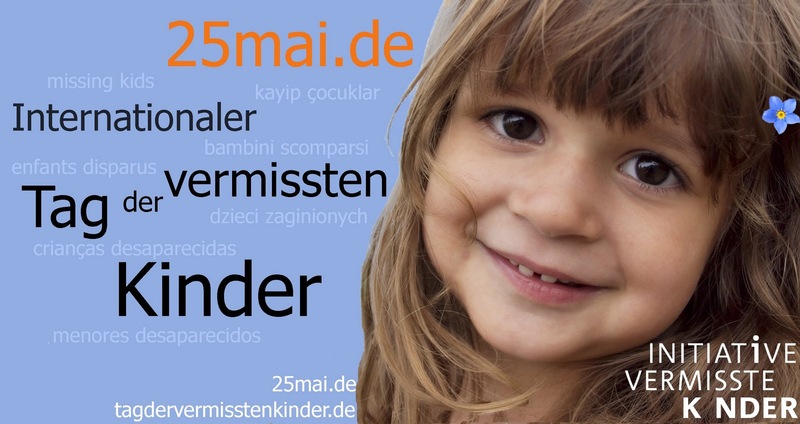 It is missing childrens day on Tuesday the 25 and Anneli Ulrik has worked quite hard to host an event in Second Life to draw attention to this. 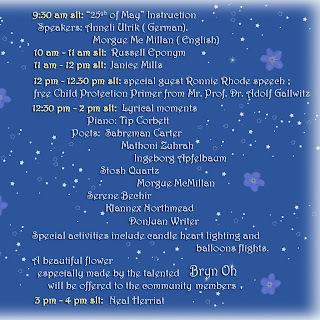 I have made a Forget me not flower with a poem inside especially for this event which Anneli will be giving out. I attempted to write the poem from the perspective of a lost child and should you click the wearable flower it will play. 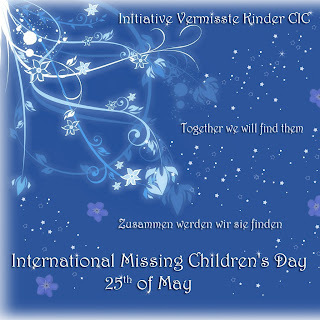 Its hard to think of something worse than having your child taken away from you, while imagining them alone with strangers praying for you to come take them home and being helpless to do so. If you have the means or desire to help promote this event then please contact .. 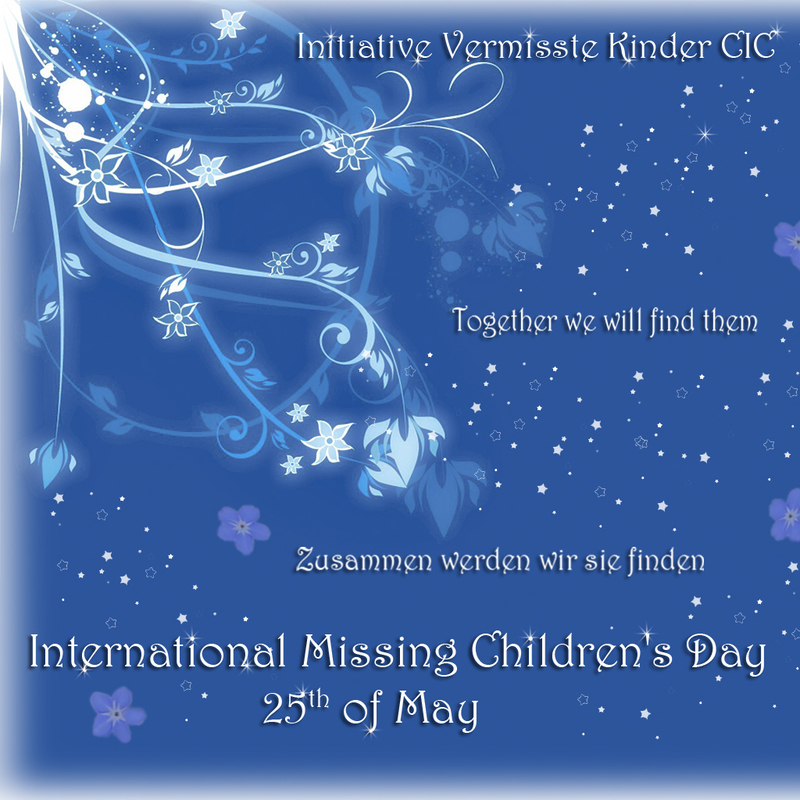 In celebration of International Missing Children’s Day, May 25th, Initiative Vermisste Kinder CIC is sponsoring a day of music, poetry and memorial celebrations. 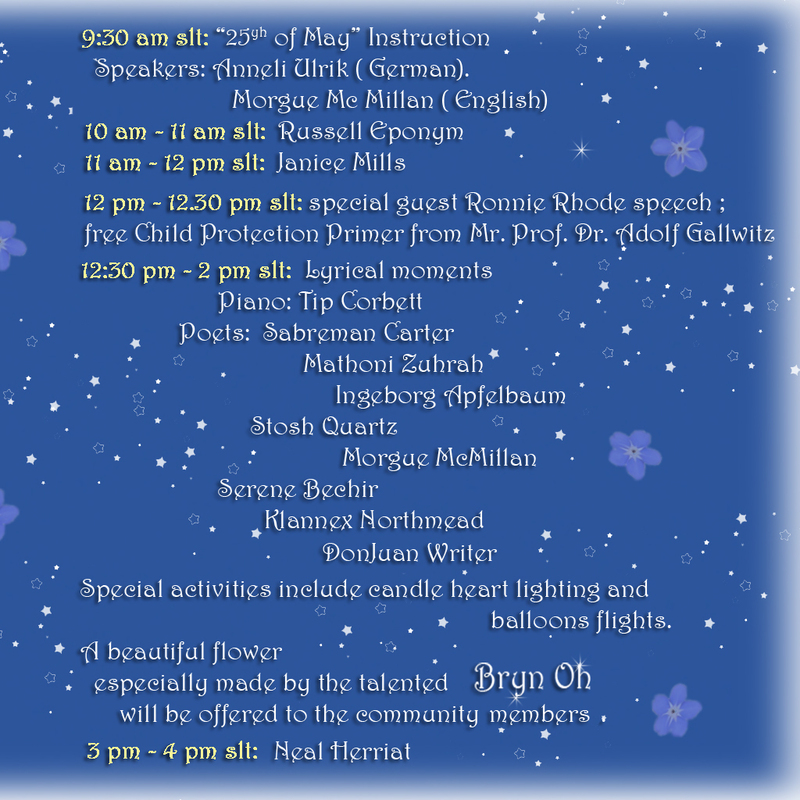 Come to the arena area of the ROF Coalition Island from 9:30am slt - 4pm slt.
" Internet Safety and Human Trafficking." Here are a few things related to the World Expo. One is a news report which shows, towards the end, how the air tree works and you are able to see where the machinima are playing on it. As you can see there are a great many organizations who competed against OPEN THIS END and specifically Aino Baar in order to have space on those screens. If I remember correctly the one which happens to be on during this report is a soccer clip. I guess its actually called football. In Canada we seem to make up new names for things which is a bit looney. I mean looney as in crazy not looney as in our $1 coin which we also call a looney. I couldn't find the embed area on the website so you will have to follow this link to see the air tree. Also they have listed on the official site the first set of machinma which is currently being shown on the screens. Its actually quite amazing to me that not only are we being shown at a great venue but each artist can now say they were shown alongside people like Peter Greenaway (The Cook, the Thief, His Wife & Her Lover, Joaquin Baldwin the winner of Cannes Short Film as well as a short by a well known Pixar artist. Each of these artists submitted work to be shown and are quite aware they are there. I am not suggesting we are equals to such great artists but it is quite rewarding to even have our names on the same page to them. So the organizers have decided to have three sets of film to be shown for two months each. You can go to the website to see it here click the British flag in top right.. then Expo in Madrid on the grey bar.. then Daily activities on the left in the green column.. then click on OPEN THIS END. I have also pasted it below for your convenience. There are other SL artists to be shown during the remaining two slots who are not listed below, this list is merely the first set of artists shown. OPEN THIS END is a nonprofit cultural organization formed by professionals of the scope of the culture, the sciences and the education that classifies, develops and exhibits contents generated with new technologies. The objective is to approach the culture and the sciences to the professionals and to the public, in general, in an actual, pleasant and fresh form. The program of OPEN THIS END in the World Expo 2010, consists in three exhibitions that expose the videos created by international artists, showing, for the first time in the history of a Universal event, a World Expo, “machinimas” and the three stages of the artistic virtual immersion. 1) REAL (R-R) This category of artistic videos shows images of the daily life using the present tools of creation. 2) VIRTUAL (R-V) These artistic videos are done with animation, CGI (Computer-generated imagery). They can recreate an appearance of reality or to be images with a style as “cartoons”, but always are virtual representations, non real. The artists create a new world. 3) MACHINIMA (V-V) These artistic videos are the maximum degree of potentiality and virtually. They are not drawings, nor cartoons. The videos are recorded, within the own virtual 3D world, called “metaverso”, using a personage, an Avatar. It allows to show the interactive avatar’s performances of the ups and downs and what happens in generated worlds; also it can show it and record it in real time, “render”. The reality does not take part. They are called “machinimas”, word composed of machine+animation+cinema. depending on what version of SL you use it will be slightly different. Aino Baar from OPEN THIS END put together the narrative for the whispering tree. The idea is that each island is missing something love/energy/colour/sound/light. If you whisper to a tree your wish it will be granted. At this point that which was missing from the land will be returned. It is quite a challenge to convey this story and most of the machinimatographers have been trying a variety of approaches. For myself I am only loosely portraying the stories. The music for this machinima was created by SL resident Tama Ahn who is a talented yet irritatingly unmotivated friend of mine. He creates some really nice builds as well as hauntingly beautiful music as you can hear in the machinima. Sadly he wanders around in a state of ennui much of the time. He is actually a bit annoyed with me as he composed this music for island three and I have placed it in this machinima for island one. Fortunately his annoyance was overpowered by his ennui. It is a real pleasure for me to tease Tama. stepped forward and made us a version of tree with animation for this event. Really appreciate her/him doing that. If you click her name in this post it will take you to her store where you will see his/her wonderful avatars. Or if you prefer check this youtube vid of one.